When Hillary Clinton spoke to a crowd in central Florida on Monday, it was an audience member who stole the show. Clinton was supposed to be talking jobs, but she started the speech by paying tribute to those affected by the Pulse Nightclub shooting. "I know how many people, families, loved ones, and friends are still grieving, and we will be with you as you rebuild your lives," Clinton told the crowd. West Palm Beach, Florida's WPTV happened to notice a man in the audience behind Clinton who looked familiar. It was Seddique Mateen, the father of Pulse shooter Omar Mateen. WPTV asked Mateen what he was thinking about when Clinton spoke about the Orlando incident. "We've been cooperating with the federal government, and that's about it," he said. "Thank you." Mateen didn't want to answer any other questions, but just hours later, WPTV reporters ran into him by chance at a rest stop on the way back to West Palm Beach. He wanted to do an interview and show off a sign he made for Clinton. "Hillary Clinton is good for United States versus Donald Trump, who has no solutions," Mateen said. We asked what went into his decision to go to the event held near Orlando, where the Pulse Nightclub shooting happened. "I spoke a lot about that and wish that my son joined the Army and fought ISIS. That would be much better," he said. 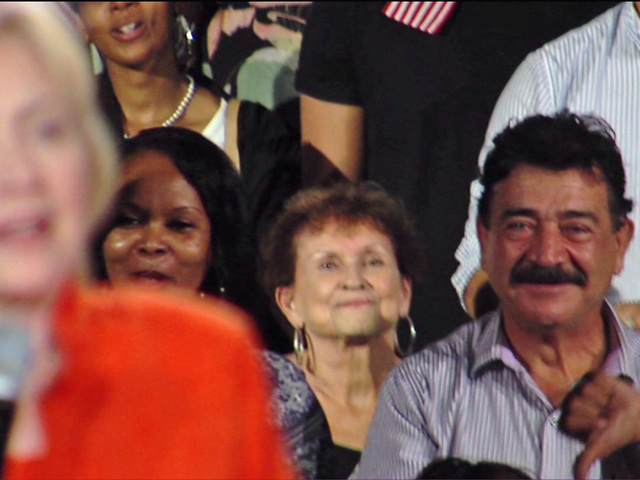 When questioned about whether Clinton's campaign knew he was going to the event and sitting directly behind the presidential candidate, Mateen said, "It's a Democratic party, so everyone can join." WPTV also asked if he thought some people would be surprised to see him there, especially given the proximity to Orlando. "Why should they be surprised? I love the United States, and I've been living here a long time," Mateen said.